Maybe you need a laugh. Maybe you have untapped creativity. Maybe you're aspiring writer. 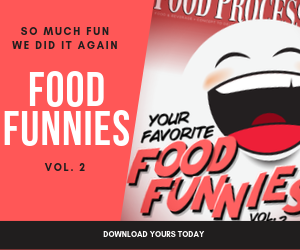 Whatever the case, Food Processing wants to introduce you to our newest feature: Food Funnies. Submit your caption, via e-mail, for the cartoon that appears below. The winning caption will be featured on the FoodProcessing.com Web site and in the FoodProcessing.com eNewsletter. And the winning caption is: "oops-- the third shift batch operator fell asleep again"
"You should see the glass of milk"
"When I said to work on portion size, I guess I should have specified which way." "What happens when the Jolly Green Giant fills in for the Keebler family." "I can't wait to see the Serving per container on the Nutritional panel." "And it meets all the nutritional requirements of the State of California School Lunch Program." "In this economy, it only takes one cookie to feed the whole family." "oops-- the third shift batch operator fell asleep again"
"Shrek's truck is at Dock 3"
"Honey, I shrunk the R&D people!" "Oh Harold, I asked for a pint of chocolate chip!" "So, uh, who wants to get chip-faced?" "Holy Chip, what did you guys do this time?"